For the third consecutive year complaints regarding telecom and television services are on the rise, according to the 2019 mid-year report released today by the Commission for Complaints for Telecom-television Services (CCTS). The CCTS is a national organization which independently handles complaints consumers have had with telecom and television providers. Its objective is to provide a fair and free avenue for consumers to access if they find their complaints are not being properly resolved by the customer service of their provider. While they saw a dip in complaints for a couple of years, said CCTS Commissioner Howard Maker, in the three years since they have seen those numbers rise, with a 73 per cent increase in the 2018 mid-year report and a 44 per cent increase this year; accounting for a total of 9,831 complaints. Wireless services were the main culprit in the complaints received by the CCTS, as it received 8,222 complaints (84 per cent of total complaints) related to wireless services. The biggest issues consumers faced were incorrect charges and non-disclosure issues which often resulted in a discrepancy between what consumers believed they were receiving and what was actually received; which combined accounted for 29 per cent of the complaints received. Non-disclosure is an issue that the CCTS recognizes as an important point that needs to be addressed and acknowledged that it is something they are working towards correcting. 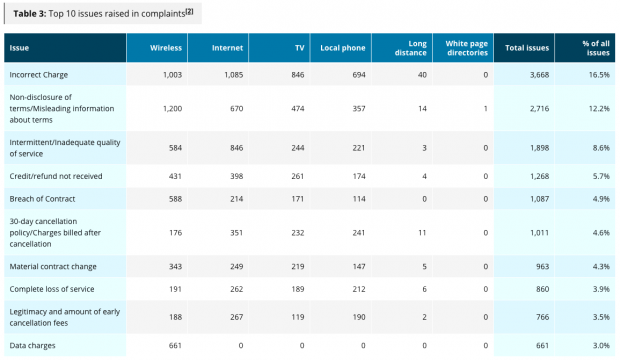 Although the “Big 3” service providers (Rogers Communications, Bell Canada, Telus Corporation) continued to comprise a majority of the complaints, two smaller providers (Cogeco Inc. and Freedom Mobile Inc.) made the top five (which accounted for 60 per cent of the complaints). Maker says he believes the reason Cogeco appears on this list is its recent change in network and a lack of preparedness in its support staff to handle that switch. Despite the consistent rise in complaints, the CCTS has continued to resolve most of the issues they handle; boasting a 92 per cent resolve rate. Maker noted that the recent rise in complaints may not be related to any change in service quality, but may instead be due to a greater awareness of the services that the CCTS provides, which has led to consumers more often taking advantage of this avenue for resolution. Visit the CCTS website to learn how you can access its services. Is Google going to offer phone plans next?